Music is a part of our life and, moreover, a part of us, because we live with it and it lives in us. Each person can be characterized according to his music preferences. When we are cheerful we listen to moving song and when we are sick at heart we prefer to listen to lyrical music. There are a lot of places where people connected with music: night clubs, cafes, fan clubs, musical bands, singers etc. All of them can use our Music Artist Easy Flash Template. Of course its design is modern and fashionable, oriented on music lovers. Header of this template contains volume progress bar and the title of the site, then comes video clip, which can lead to detailed page. Site Menu is located on the left side of the screen and is placed chaotic. Each menu entry is designed in the form of rumpled paper, when open it the sheet is unwrapped. This unique design make navigation through the site interesting and convenient. 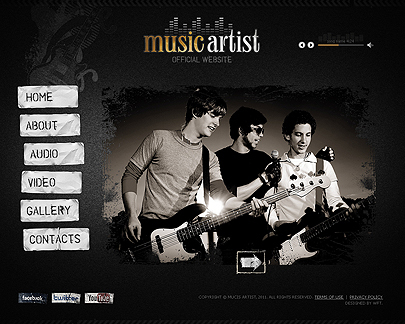 Buy our Music Artist Easy Flash Template and make your online project popular among users. Enjoy the quality.